I just recently finished reading The Peacemaker by Ken Sande. There are just times when I read a book, and I believe it is so good and informative that I would truly recommend it to every Christian I know. It is rich with information, help, and scripture on how to deal with conflict biblically. The reason this book works so well is it instructs how to deal with conflict as a Christian and how does that look different from the rest of the world. We will all have conflict with our spouse, our children, our friends, our co-workers, and our neighbors. It will always be there. Misunderstandings, hurt feelings, and outright sin are perpetrated by others and even by us at times, but how in the world do we deal with it? This book walks through it all. Matthew 18 is such a rich text. It really can solve a lot of situations such as a friend comes to you for advice on how to deal with a situation with another friend. The question is have they talked to their friend one on one? A person unfriends you on Facebook. Do you call them out passive aggressively on Facebook, or do you talk to them one on one? What if they won’t speak to you? Then you go and get a witness who is hopefully someone they would listen to, and you don’t talk badly about them prior to the meeting either. Reconciliation is important to God. He sent His only son, Jesus Christ, to reconcile us to Himself. He desires His people to be reconciled with one another even when it is extremely difficult. Within the last 2 months or so, I have referenced this book and the scriptures held within numerous times. 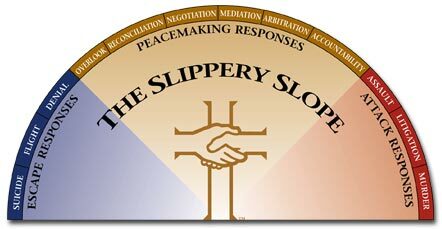 The Slippery Slope is a diagram made by Peacemaker Ministries which outlines the different responses to conflict. On one side of the diagram are Escape Responses (I like to call them passive) and on the opposite are Attack Responses. Neither of these are the healthiest way to deal with conflict. Peacemaking Responses are the ones in the middle such as reconciliation, negotiation, or even overlooking an offense. Images copyrighted to Peacemaker Ministries. It is a conversation I have with my kids all of the time. How does one deal with conflict? One has a friend who is no longer talking to them on the playground. Then go talk to them one on one (Matthew 18:15). One has a friend who does not keep their word. Then overlook an offense (Proverbs 19:11). One has a friend who outright sins against them. Then go talk with them (Matthew 18:15) and forgive as you have been forgiven (Ephesians 4:32). How does resolving conflict in your life set you apart from those around you? I would say that many Christians are just really uninformed about how to deal with conflict in their lives. I know I had lots of questions especially with the really hard aspects of conflict. 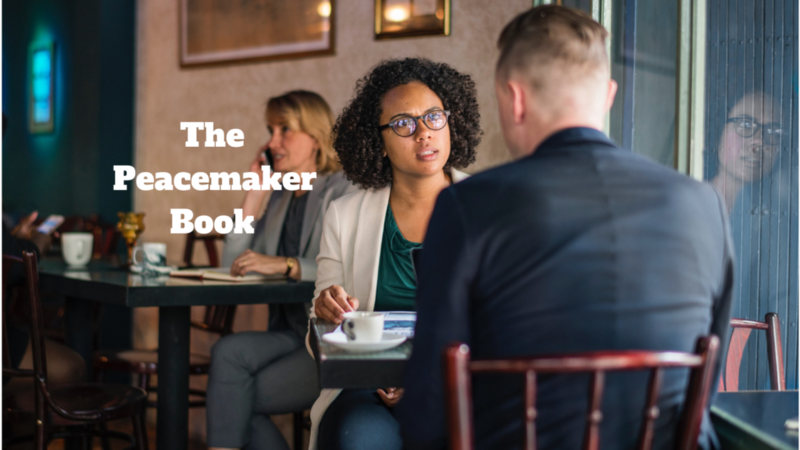 Peacemaker Ministries even has a book called The Young Peacemaker which I would like to go through with my youngest daughter. I believe it would be a wonderful gift to give my kids to equip them with how to deal with conflict biblically. Interested in reading about another book I loved? Try the The Hiding Place. God Bless you. Wonderful message. I am glad you enjoyed this blog post. God bless you, Marianna!